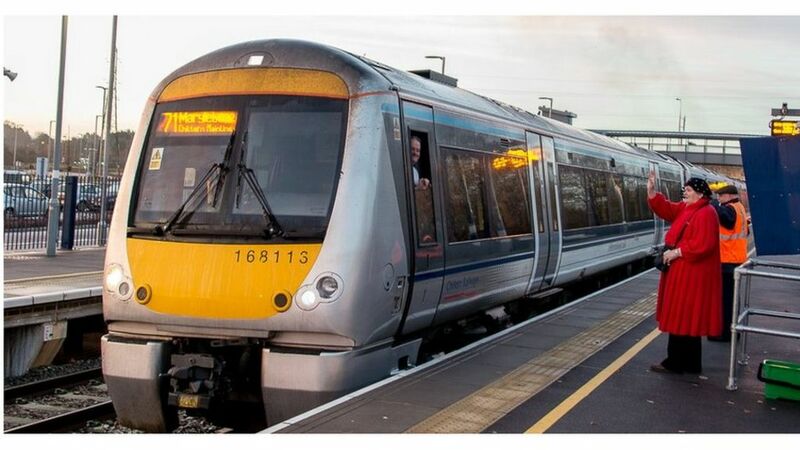 Trains have started running on a second line between London and Oxford city centre following a £320m project. Chiltern Railways said its new service to London Marylebone would offer 'genuine competition'. Great Western Railway already runs a service between Oxford and London Paddington. The new service started running from the new station Oxford Parkway, when it opened a year ago, but was extended to the city centre from Monday. Network Rail contributed £190m towards the project, with Chiltern Railways investing £130m. More than 850,000 journeys are expected to be taken to or from Oxford on the new services in the next year. Trains are now running between London Marylebone and central Oxford following a £320m project. This Chiltern Railways train arrived at Oxford Parkway at 19.53 from Marylebone, carrying an impressive load of commuters; and returned as the 20.08 [see image 55244]. First Great Western DMU no 165137 waiting to depart from Oxford on 17 May with a service to Bicester Town. Road approach to the Great Central Railway's London terminus at Marylebone, seen here looking west in July 2005.